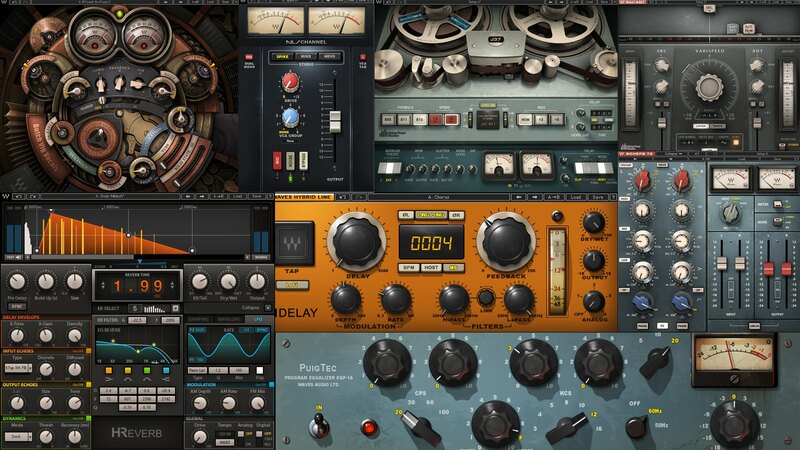 The Waves Audio plugins bundle, offers an almost intimidating amount of compressors, saturators, tape emulations, equalisers, and pretty much every audio processing device, with surgical precision. The choices at bay are almost limitless and hence we’ve compiled our five most essential plugins to help you navigate through the maze. The J 37 is a tape emulation/ saturation plugin with three different types of tape, the 815 formula gives you a replication of the sound which is closer to the original sound yet provides for the sonic warmth you’d expect from tape, going down to the 811 and the 888 formulas you get a more distorted colouring of the sound. From right to left, the 815 is an emulation of tape from a more recent time frame while the 811 and 888 are based on more classic tape types. Driving the input control further on the plugin will start to give you a more saturated sound which can be a great tool for gluing your drums together, the output/input link option allows you to have the desired effect without driving the overall volume up and acts as a makeup gain knob would on a compressor.Whilst the tape speed on 7.5 I.P.S(Inches Per Second) brings out the low end in the overall sound, 15 I.P.S brings out the highs more distinctly and is what I’d generally go to for taming hats, shakers and other percussions in the region. 7.5 used sparsely on low toms, claps, snares and other percussive or low/ low mid material gives the desired effect.Since tape by its very nature applies a gradual cut on the extreme highs and on the lows , placing the same after a delay in a chain can sometimes lead to a more closed off sound, which may or may not be what you desire. The wow and flutter settings make for a brilliant addition especially on sounds like guitars, strings and pads to create an organic tremolo effect. The noise knob simply produces a white noise to depict the classic tape effect and the saturation control, allows for how much saturation you would like to apply on the overall sound.The bias section has three options, nom, + 3 and + 5. On the first, the input signal is sent in at the normal level, on +3 and +5 the signal is driven further to amplify the sound and hence provides a more noticeable effect.The delay time on the plugin can either be kept in sync to have unison between the left and right channel or you can displace the same by hand to create a wider stereo image. The API 550B is unlike any other equalizer. Rather than offer a huge assortment of complex features, the API 550b provides exactly the right number of controls. Its four EQ bands are overlapped significantly to aid in dual roles as problem solver and sweetening device with each band offering seven switchable filter frequencies that span four-to-five octaves. These frequencies, purposely selected to be musical rather than numeric, were selected by an experienced “who’s who” list of the industry’s most proficient engineers. If you’re an Ableton user, you’d find the inbuilt EQ 8 to be absolutely stunning for cutting frequencies without adding any colour whatsoever, yet when adding harmonics it doesn’t do quite as good a job. he API 550 B is my go to tool for enhancing signals using reciprocal and repeatable filtering. I find myself going to this plugin to add some nice edge to the midrange on just about anything that needs it. On the note of adding harmonics, when working with baselines rich in the sub frequencies alone, the same is generally left out and cannot be heard on smaller speakers. Maxxbass adds harmonic content to the low end to reciprocate for the same and creates a psychoacoustic effect where the bass comes through even on your laptop speakers. A cautionary note when using the same, the decay control when set wide can sound fantastic on smaller speakers but then sounds blurred or muddy when played back on monitors and hence using it sparely is optimal, since overdoing the same could run a riot on your overall mix by adding harmonics in the low mids which did not previously exist. The controls are fairly intuitive whereby you can control the original signal marked as “Original Bass” and your amplified harmonics with the Maxxbass volume fader. You can also additionally control the balance of both the signals with the fader provided underneath the graph and choose one of the three curves provided for the same, namely 6,12 and 24 dB curves depending on whether you want a more aggressive or subtle enhancement. The waves S1 Imager is used to widen or narrow the stereo image of any said sound and is an excellent tool to add width to your mix. The graph displays your stereo filed and you can accordingly adjust the width of the given signal in either a left/right or mid/side mode. Another amazing feature of the same is the asymmetry function, which allows you to create a non-linear image of the signal. When using this plugin initially, it can be tempting to throw it on just about everything(except your kick and bass), but on a quick reference in mono you might find that most of your sounds have dropped out of the mix and hence using the same in parallel can be a good approach to not destroying your original signal while giving the overall signal width. Wideness in a mix is perceived when a particular element or group of elements sit far apart, using this on all your signals will have a counter intuitive effect, this however is an invaluable tool to use on a couple of elements alone in the mix. On the topic of stereo image, the Paz analyzer gives you a graphical notation of your signals image, you can separate the same to individually view your left and right signal or view the overall graph in making your mixing decisions. This would sit best after your S1 Imager in the chain if you’d like to view the changes in image before and after its usage. This can be extremely helpful in ensuring each sound has its own space in the mix but at the end of it, it’s always best to use your ears and not trust what you see on the graph itself.